Goldman cut their predictions on precious metals, and now it is also the order for the energy market, especially for oil. The bank cut its forecast for oil price growth for 2019 given the still strong market supply and sustainable shale gas production in the US. According to the bank, Brent will run an average of about $ 62.50 a barrel this year, down from the previous assumption of $ 70. The crude WTI variety will average around $ 55.50 a barrel, down from the previous $ 64.50. 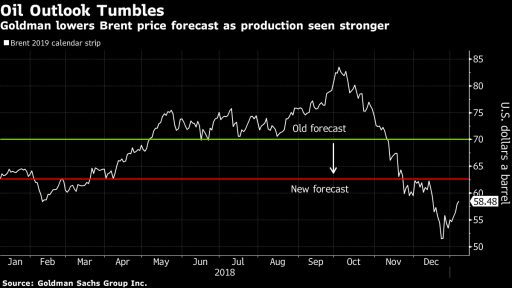 Societe Generale also cut its oil outlook in 2019 by $ 9 a barrel, with the French bank predicting Brent averaging about $ 64.25 and WTI about $ 57.25. The jump in production by OPEC in the past year means that the market is well stocked and saturated for the beginning of the new year. In Canada and Brazil, we have launched massive projects for years to come, which will also boost oil supply in 2019. According to Goldman and SocGen, strong oil outflows have been exaggerated. It appears that the price has been estimated to have a global economic growth of about 2.5% in 2019, which is well below expectations of economists for growth of 3.5%. 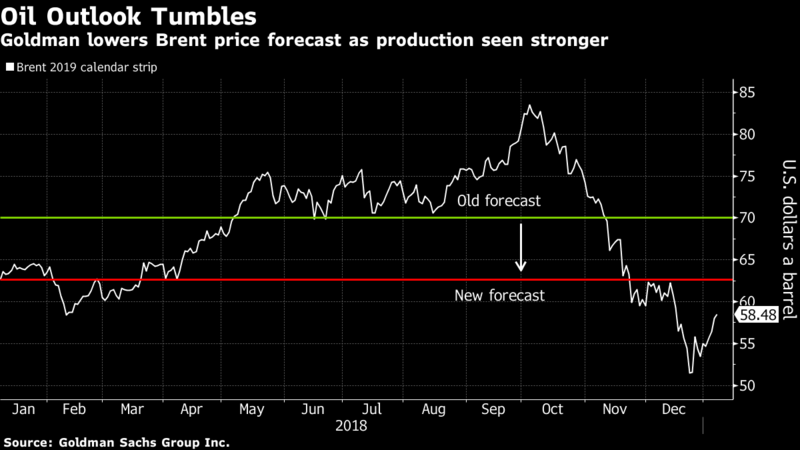 Goldman says the markets have appreciated a rather pessimistic outlook for growth, which, however, provides good prerequisites for renewed price increases as long as the global economy holds more than 2.5%. Graphs: Used with permission of Bloomberg Finance L.P.